ABC in a flat bone is a rare presentation and this reports highlights on diagnosis on management of such case. Department of orthopaedics, Padmashree Dr. D. Y Patil Medical College, Navi Mumbai. India. Introduction: Aneurysmal bone cyst is an expansile, lytic, multiloculated, fluid filled cavities which usually occurs in the metaphysis of the long bones. ABC of the pubic ramus is a rare entity. Case Report: We present a case of a 21 year old male who presented with a swelling of the right inguinal region which was gradually progressive. Radiologically, there was a lytic expansile lesion of the superior pubic ramus. A contrast computed tomography revealed multiloculated cystic cavities and histopathology confirmed the diagnosis of ABC. Surgical excision of the complete tumor by anterior approach was done. Till date (2 years since surgery) patient has no recurrence. Conclusion: ABC of pubic ramus is a rare entity and other differentials should always be kept in mind with confirmation of diagnosis by histopathology. Treatment with surgical curettage and bone grafting the defect is curative in selective cases but in this case due to size and location excision is the choice of treatment. Keywords: Aneurysmal bone cyst, Pelvic bone, Pubic ramus, multiloculated. Aneurysmal bone cyst (ABC) is a benign, expansile, multiloculated, cystic, vascular, locally destructive osteolytic lesion of the bone [1,2]. It is charachterised by connective tissue proliferation of multiple blood filled cavities. Presumably due to local haemodynamic disturbances, the process arises de novo in bones or it can be traumatic in origin or recent studies showed anomalies of chromosome 17[5,6] . ABC is mainly seen in the metaphyseal region of the long bones and the vertebrae.Majority of the patients with ABC are in the 2nd decade with slight female preponderance. Pubic ramus is a rare site for ABC. In this paper we describe a case of ABC in the superior pubic ramus of a 21 year old patient. A 21 year old male presented with a history of 6 months swelling in the right inguinal region. The swelling was noticed by the patient after a trivial fall while playing football. Since then the swelling was gradually increasing in size. The swelling was associated with dull aching pain which was localised to the inguinal region with no radiation of the pain. There was no weight loss. On physical examination there was a palpable bony hard mass over the right inguinal region which was fixed to the underlying bone. The right femoral and other peripheral pulses were normal. There was no local warmth and erythema. The movement of the hip was free. Power and sensation of the right lower limb was normal. Plain radiography of the pelvis showed a huge expansile lytic lesion of the right superior pubic ramus (Fig. 1). 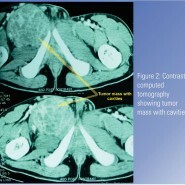 A contrast computed tomography of the pelvis was done which demonstrated an expansile lytic lesion with cavities arising from the right superior pubic ramus. It approximately measured 5cm x 6cm (Fig. 2). CT angiography was done which showed compression and displacement of the femoral vessels. Reduced flow was seen in the femoral artery (Fig. 3). Preoperatively several differential diagnosis were kept in mind like primary ABC, ABC secondary to giant cell tumor or a malignant tumor like chondrosarcoma. With the help of cardiovascular-thoracic surgeons anterior approach was taken to reach the tumor site (Fig. 4). The diagnosis of ABC was established by frozen section intraoperatively. Then complete excision of the tumor was done after sectioning the inguinal ligament to get fuller access to the tumor , which was later reconstructed(by suturing with vicryl no.2 and supplemented with rectus sheath as double breasting) The operative specimen consisted of a large osseous structure and many curetted fragments of the soft tissue. The tumor approximately weighed 542gm and size being 11.2cmx 6cm x 5cm(Fig. 5).The diagnosis was confirmed by histo-pathology (Fig. 6). The patient did well post operatively and till date (2 years since surgery) there is no recurrence (with persistence of bone gap). Aneurysmal bone cyst of the pubic rami is a rare lesion. It may include a wide spectrum of differentials ranging from non neoplastic cysts, benign or malignant neoplastic lesion ranging from simple bone cyst, ABC (primary or secondary), chondroblastoma, Giant cell tumor and an osteosarcoma with secondary ABC formation to an ossifying hematoma or pseudotumor of haemophilia. The pelvis is not an unusual site for aneurismal bone cyst; about 10% of the cases occur in this area. A study by Hammound et al. of the pelvic bone cysts revealed that the majority of bone cysts occur in the illium, followed by pubic ramus and ischium, respectively. ABC when presents in an aggressive manner can be difficult to differentiate from telengiectatic osteosarcoma although telengiactatic osteosarcoma is more common in patients over 20 years of age. Histopathologically ABC is characterized by hemorrhagic, cystic and cavernous spaces surrounded by fibrous septa composed of mildly to moderately mitotically active spindle cells intermixed with scattered osteoclast-like multinucleated giant cells. Areas of new and reactive bone formation can also be found in the ABC. Mitotic figures are common to ABC, but no atypical figures should be evident. Radiologically, ABCs from pelvis demonstrate a fusiform expansile lesion. Sometimes, an expansile lobulated, lytic, multiseptated cystic lesions will contain fluid-fluid level.There are four known radiographic stages of ABC: initial stage, active and aggressive stage, stability and healing stages. There are two forms of ABC: liquid and solid forms better highlighted in CT scan. Our patient had a expansile lytic lesion with cavities with no fluid in the cavities. The diagnostic problems are due to the rapid growth of ABC and its extensive destruction of bone. The diagnosis is more difficult if there is a soft tissue extension. Although preoperative MRI is helpful as it helps in preoperative planning and also shows the fluid-fluid level which is characteristic of ABC but still open biopsy must be performed due to high number of accompanying tumors. When doing a biopsy the sample should include material from the entire lesion as limited biopsy can cause a coexisting lesion to be missed, leaving the patient with a morbid prognosis. There are various treatment modalities based on the site and size of the lesion, which include curettage, which may be supplemented with various adjuvant therapies such as bone grafting, use of liquid nitrogen, phenol instillation and Poly methyl methacrylate (PMMA) cement. Other treatment options include low dose radiotherapy or preoperative arterial embolisation for tumors which are not resectable or are highly vascular. Enneking classified the surgical interventions into three types: (1) intralesional (curettage and bone grafting), (2) marginal (en bloc) resection, and (3) wide resection (segmental resection). During pre-operative assessment, the location and growth pattern of the ABC is noted which is of utmost importance. It is advantageous if the ABC grows superficially and involves only less than one-third of the bone width. Such cases are suitable for intra-lesional excision. This is a good treatment for ABC and results in normal joint function and few local recurrences. However, in sites such as the pelvis or spine or when the size of the cyst is particularly large, surgical treatment of extraperiosteal excision and bone grafting become difficult and risky. Thus, careful curettage and bone grafting still remain the surgical method of choice in such cases . Despite cure rate of 90-95%, one of the most common problems encountered is recurrence. The incidence of recurrence has been noted to vary between 59% in cases treated with intralesional excision and 0% in cases with resection. Recurrence usually occurs during the first two year after surgery.The factors causing recurrence are still unknown. Some suggested factors are age, lesion location, lesion size and number of mitotic figures. Therefore, a patient of ABC needs to be observed for at least this period of time to exclude any recurrence. It is beneficial to detect recurrence early when the lesion is still small and easier to treat. To conclude ABC of pubic ramus is an uncommon entity. To diagnose such a case proper clinical and radiological and histopathological evaluation is required to rule out other differentials of an expansile, lytic lesion. This helps in formulating a proper treatment plan and prognosticating the disease. 1.Huang TL, Chen WM, Chen WY and Chen TH. Huge aneurismal bone cyst of iliac bone in middle aged female. J Chin Med Assoc 2004, 67(2):99-103. 2.Choe JG, kim sh and Eoh W. Aneurysmal bone cyst arising from iliac bone mimicking liposarcoma. Korean J Spine 2008;5(3):234-236. 3.Brastianos P, Gokaslan Z and McCarthy EF. Aneurysmal bone cysts of the sacrum: a report of ten cases and review of literature. Iowa Orthop J 2009; 29:74-78. 4. Haft GE; Buckwalter JA. Aneurysmal bone cyst following tibial fracture: a case report. Iowa Orthop J. 2003;23:100-2. 5. Althof PA; Ohmori K; Zhou M; Bailey RS; Nelson M., Bridge JA. Cytogenetic and molecular cytogenetic findings in 43 aneurysmal bone cysts: aberrations of 17p mapped to 17p13.2 by fluorescence in situ hybridization. Mod pathol. 2004 May; 17(5): 518-25. 6. Hereng C; Thiry A; Dresse MF; Born J; Flagothier C; Vanstaelen G; Allongton N; Bex V. Translocation (16;17)(q22;p13) is a recurrent anomaly of aneurysmal bone cysts. Cancer Genet Cytogenet. 2001 May; 127(1): 83-4. 7. Mirra JM. 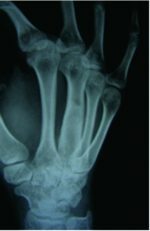 Bone Tumors: Clinical, radiologic, and pathologic correlations. Philedelphia: Lea and Febiger; 1989. P. 1267-311. 8. Khan AQ, Siddiqui YS, Parameshwar A, Anwar-Sherwani MK. Aneurysmal bone cyst of pubis. A rare presentation Saudi Med J. 2010 Mar;31(3):317-20. 9. Ajay malik, Prabal Deb, N.S Mani, John D’Souza.Aneurysmal bone cyst of the calcaneum: An expansile locally destructive lesion. Journal of Cancer Research and Therapeutics-October-December 2010-Volume 6-Issue 4:570-572. 10. William Garnjobst, Richard Hopkins. Aneurysmal bone cyst of pubis. Journal of Bone And Joint Surgery. Volume 49-A Number 5. July 1967. 11.Hammoud S, Weber K and McCarthy EF. Unicameral bone cysts of the pelvis: a study of 16 cases. The Iowa Orthopaedic Journal 2005;25:69-74. 12. Anand MK, Wang EA. Aneurysmal Bone Cyst. eMedicine, Jan 2007. 13.Sharifah MIA, Nor Hazla MH, Surya A, Tan SP. Pelvic aneurismal bone cyst. Biomed Imaging Interv J 2011; 7(4):e24. 14. Bajracharya S, Khanal GP, Sundas A, Pandey SR and Singh MP. Aneurysmal bone cyst of the pelvis : a challenge in treatment: review of the literature. Iowa Orthop J 2008;8:1. 15. Unni KK, Inwards YC. Conditions that normally simulate primary neoplasms of the bone. In:Unni K K, Inwards Y C, editors. Dahlin’s Bone Tumors.6th edition.Philedelphia:Lippincott Williams and Wilkins;2010.p.305-80. 16. Mankin HJ, Hornicek FJ, Ortiz-Cruz E, Villafuerte J and Gebhardt MC. Aneurysmal Bone Cyst: A Review of 150 Patients. Journal of Clinical Oncology 2005; 23(27):6756–6762. 17.Marcove RC, Sheth DS, Takemoto S, Healey JH. The treatment of aneurysmal bone cyst. Clin Orthop Relat Res 1995 311: 157-163. 18. Schreuder HW, Veth RP, Pruszczynski M, Lemmens JA, Koops HS, Molenaar WM. Aneurysmal bone cysts treated by curettage, cryotherapy and bone grafting. JBJS 1997 79B (1): 20-25. 19.Rastogi S, Varshney M K, Trikha V, Khan SA, Choudhury, Safaya BR. Treatment of aneurysmal bone cysts with percutaneous sclerotherapy using polidocanol. A review of 72 cases with long-term follow-up. JBJS 2006; 88B (9): 1212-1216.